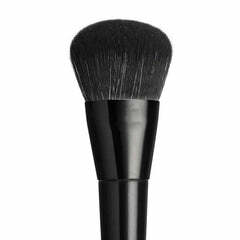 This elegant stippling brush is the ultimate professional tool for creating a flawless complexion. Its premium shape and soft bristles blend liquids, mousses, creams, primers and powders. This powerhouse of a brush creates a smooth, even result every time, while its cruelty-free bristles offer a guilt-free way to enjoy your makeup application. 20.5cm full length. Bristles - 4cm high, and 3cm wide.